Whether you're a master crafter, a carpenter, a jewelry designer, or have become passionate about making the best home d cor in town, now is the time to go from hobby to full-time business owner. 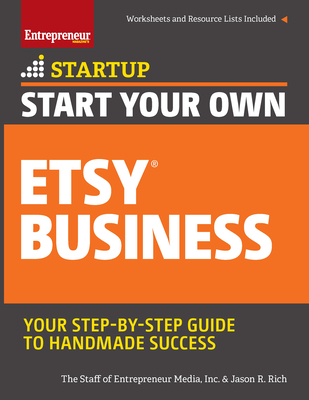 And with million shoppers ready to discover your unique offerings it only makes sense to join the largest, most successful online community of creative entrepreneurs on Etsy(R). Plus, gain worksheets, templates, resource lists and tips designed to go from passion to profits. If you're ready to share your passion for your craft with millions around the world, this guide is for you. Entrepreneur Media is the premier content provider for and about entrepreneurs. For more than 30 years, Entrepreneur Media has been setting the course for small business success. From startup to retirement, millions of entrepreneurs and small business owners trust the Entrepreneur Media family -- Entrepreneur magazine, Entrepreneur.com, Entrepreneur Press, EntrepreneurEnEspanol.com, and our industry partners -- to point them in the right direction. Jason R. Rich is the author of more than 55 books, as well as a frequent contributor to numerous national magazines, major daily newspapers, and popular websites. He's also an accomplished photographer.